LEE COUNTY, Fla. -- New Year, same boat. 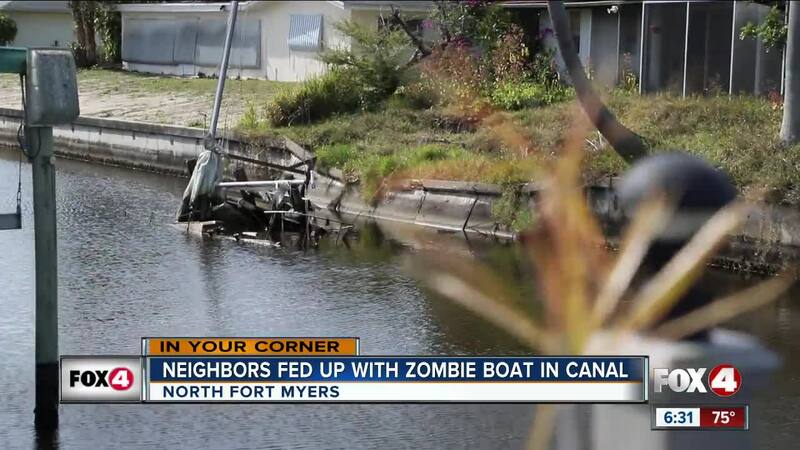 People who live in a North Fort Myers neighborhood are fed up with looking at a derelict boat in their canal for nearly a year and a half. Fox 4 told you about this story in October 2018. Just 3 months later, neighbors are still looking for answers after they were told the West Coast Inland Navigational District would take care of it. Neighbors aren’t sure where the owner of the boat and home is, or why they left the property the way it is. It’s been quite an eyesore according to neighbors who live here. “The biggest travesty is for us, we have to look at it,” said Gary Furdell, who’s lived in the area since 1999. He says he’s worried about his neighbors who are trying to sell a house. “The people next door, are trying to sell their home and they’re probably losing $60,000, $70,000 off the asking price of the house,” he said. Fox 4 called Billee Silva, a Realtor with Jones & Company, she’s that realtor that’s having trouble selling the home since it went on the market in October 2018. She says she’s shown the home to 10 different people, and each person was put off by the boat in the canal. “It just frustrates the daylights out of me that they can do that to our environment and our water and no one seems to care,” Silva said. We also gave a call to the West Coast Inland Navigational District, they tell us that they’re “working on it,” which isn’t the best answer for people looking for answers. “What’s something, something would get it out, fix the sea wall and make it look presentable so that everybody else doesn’t have to look at it,” said Furdell.